← just a long night. a really, really long night. as much as I encourage others to avoid avoid overusing the “to be” verb, I have to say that THERE ARE may situations in life where words just won’t do; where only a facial expression suffices. Sort of similar to those moments in The Office, where Michael does something embarrassingly ridiculous, and Jim turns to the camera, looking for some semblance of validation or perhaps, just a witness. I often refer to these moments as “Muppet Face” times, when I cannot or will not find words to describe how I feel, but only communicate with my expression. It’s usually when I can’t believe something has reached a certain level of stupidity, or when a person is so rude or foolish, I need to allow for a quiet pause, to let the universe recognize and account for the situation at hand. Waitressing is superb for this, and offers up many opportunities for Muppet Face. Anyway, I needed to bring this to the table of recognition that is my blog. I am sure I’ll be referencing Muppet Face quite often. So there ya go. 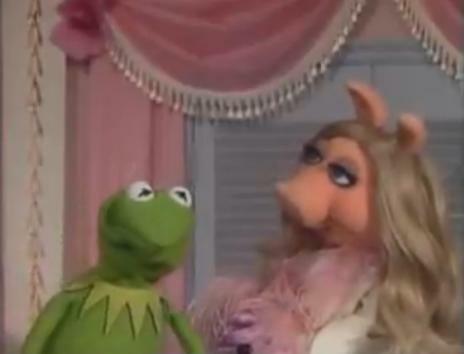 Grainy picture, but a tribute to the fact that we all have a Miss Piggy in our life that brings out that Kermit smushed grimace. words can't do what the face can. This entry was posted in waitressing is great and tagged Muppet Face. Bookmark the permalink.